The Huntington Study Group (HSG) was recently featured on morning programming at two local news stations in Rochester, NY. WROC News Channel 8 (CBS affiliate) and Fox Rochester (WUHF) scheduled appearances by the HSG following the recent announcement of their 100th credentialed research site in North America. The interviews highlight the Huntington Study Group’s role in conducting HD clinical trials, raising awareness of the disease to the community, and providing professional education to healthcare professionals. Links to the recorded interviews are included below. Founded in 1993 in Rochester, NY, the Huntington Study Group (HSG) is a not-for-profit organization comprised of the world’s first and largest collaborative network of experts in Huntington disease. The mission of the HSG is seeking treatments that make a difference for those affected by HD. With more than 650 credentialed HD experts at 122 HSG credentialed research sites worldwide, the HSG is a leader in conducting clinical trials for HD. The HSG also offers educational services like CME4HD ™ for healthcare professionals and care providers on treating patients with HD. For more information, visit our website www.huntingtonstudygroup.org. The Huntington Study Group (HSG), a world leader in spearheading research and conducting clinical trials in Huntington disease (HD), is excited to announce that it has credentialed Inland Northwest Research, LLC as the 100th HSG site in North America. In addition to the 100 HSG credentialed sites in the United States and Canada, the HSG has another 22 credentialed research sites worldwide. To receive HSG credentialed status, a research site must be involved with the care of individuals with HD, have a demonstrated history of conducting HD trials or research studies, maintain staff who are experienced in HD, and include an HSG-credentialed investigator and coordinator. Media Note: High-resolution photos and bios of HSG leaders are available upon request. Photo/footage opportunities may also be arranged. Today the Huntington Study Group (HSG) announced the restructuring of its Education Committee into four distinct committees aligned with the organization’s overall strategic plan for educational programs. The four committees that will lead the HSG’s current and planned education initiatives are: Member Education, Provider Education, Family Education, and Annual Meeting Education. The HSG has selected several longstanding members of the organization that are well-known experts in their field for an initial 3-year term. Dr. Mary Edmondson has agreed to chair the Provider Education Committee. Jody Goldstein will chair the Member Education Committee. Dr. Martha Nance will serve as chair for the Family Education Committee, while Dr. Lauren Seeberger will take on the role of chair for the Annual Meeting Education Committee. Founded in 1993, the Huntington Study Group is a not-for-profit company and the world’s first Huntington’s Disease (HD) cooperative therapeutic research organization. The HSG is a leader in conducting clinical trials for HD. The HSG also offers educational services to healthcare professionals and care providers on treating patients with HD. The Huntington Study Group announces Sacramento, California as the location for this year’s annual meeting: HSG 2019. Dr. Vicki Wheelock and her team at our UC Davis site will serve as the HSG Host Site for what has long been the organization’s hallmark event, bringing together leaders in HD research, the HD community, sponsors, and families to share their knowledge. HSG 2019 general sessions will be held on November 7th and 8th, with the event concluding on Saturday, November 9th at the Hyatt Regency. This year’s meeting will continue to feature the signature Family Day session on Saturday for families members to get in-person insights and helpful advice for leaders in the field. Saturday will also offer the HSG’s accredited provider training, CME4HD, in-person. Additional information regarding registration and agenda will be provided as those details become available. The latest issue, Volume 20 of HD Insights has arrived and available online for viewing/downloading. 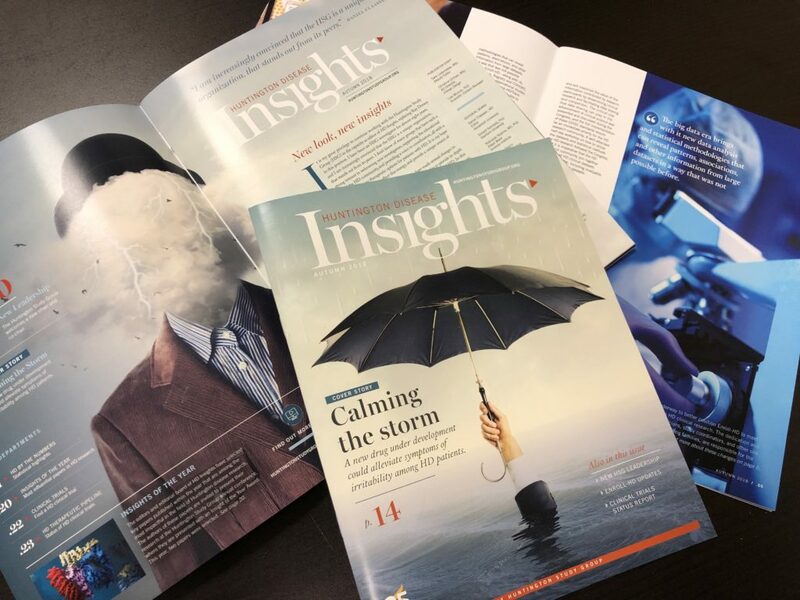 This first edition of HD Insights version 2.0 includes several visual, style and content updates from editor Daniel Claassen, MD and deputy editor Sara LaJeunesse. The Huntington S tudy Group (HSG) is pleased to announce the that Dr. Nicolò Zarotti has been named recipient of the Peter Como Scholarship to attend the renowned annual meeting. 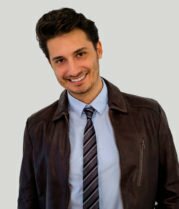 Dr. Zarotti obtained his Bachelor’s and Master’s degree in Psychology in Italy, and later joined Lancaster University (UK), where he completed his PhD focused on emotional processing and communication in Huntington disease (HD). Dr. Zarotti is currently part of a team collaborating with the British Psychological Society to produce new guidance on psychological approaches to the understanding and treatment of psychological difficulties in people with motor neurodegenerative conditions such as HD. The Peter Como Scholarship, named in memory of one of HSG’s founders and biggest supporters, is awarded annually for a professional in the mental health field to attend HSG 2018: Unlocking HD. The Como Scholarship includes two nights’ lodging, travel funding, and a modest stipend. The Huntington Study Group was formed in 1993 and is the world’s first HD cooperative therapeutic research organization. Twenty-five years later, HSG is a world leader in facilitating high quality clinical research trials and studies that work toward finding effective treatments for HD. HSG has the first and largest HD clinical research network of more than 400 active and compassionate investigators, coordinators, scientists and HD experts at more than 120 credentialed research sites around the globe. HSG members are world experts in caring for individuals and families impacted by Huntington disease. Visit https://huntingtonstudygroup.org/ for more information. The Huntington Study Group (HSG) announces the 2018 CME4HD Online scholarship winners who have been awarded funding to attend its renowned annual meeting, HSG 2018: Unlocking HD. 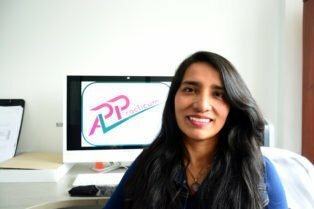 Maryluz Camargo Mendoza, Ph.D, associate professor at the National University of Colombia, Bogota, has received a scholarship for referring 49 people who successfully completed five CME4HD Online modules. 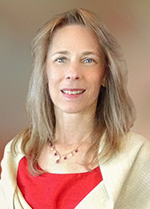 Addie Patterson, D.O., associate professor at the University of Gainesville won the random drawing of 133 participants who completed five modules successfully. Both scholarship winners receive airfare, hotel and a travel stipend to attend the conference, held at ZaZa Hotel in Houston in November. CME4HD Online is a continuing medical education program designed to teach healthcare providers how to care for and manage individuals with Huntington disease (HD). Participants gain the knowledge, tools,and resources needed to provide quality care to families impacted by HD, while learning from worldwide HD experts who teach the course. Topics and discussion include symptoms and diagnosis, HD treatments, ethical dilemmas in genetic testing, strategies for disease management, translation of complex clinical information for families and the role of ancillary services in the management of HD. The CME4HD referral program encourages sharing and completion of the program modules to help educate medical professionals about Huntington’s Disease in order to help patients receive better care between sub-specialist appointments. CME4HD Online program was first shared at HSG’s annual event and is now available online free of charge. The program was planned and implemented by HSG in partnership with the North American Center for Continuing Education, LLC (NACCME). This program was made possible, in part, by an independent educational grant from TEVA Pharmaceuticals. The Huntington Study Group was formed in 1993 and is the world’s first HD cooperative therapeutic research organization. Twenty five years later, HSG is a world leader in facilitating high quality clinical research trials and studies that work toward finding effective treatments for HD. HSG has the first and largest HD clinical research network of more than 400 active and compassionate investigators, coordinators, scientists and HD experts at more than 120 credentialed research sites around the globe. HSG members are world experts in caring for individuals and families impacted by Huntington disease. Visit https://huntingtonstudygroup.org/ for more information. The Huntington Study Group (HSG) is pleased to announce that Andrew Feigin, MD, and Elise Kayson, MS, ANP, have been elected as the chair and co-chair, respectively, of HSG, a world-wide network of Huntington disease (HD) researchers. Both Feigin and Kayson have dedicated their careers to the clinical care of patients and families and research in HD. Feigin and Kayson will begin their four-year term as chair and co-chair May 1, 2018, succeeding Ray Dorsey and Blair Leavitt, who along with Julie Stout, Joni Steinman, and Shari Kinel, expertly led HSG through the last four years. They were democratically elected by HSG’s world-wide membership of more than 500 investigators, coordinators, and other researchers and care providers. Feigin, a Professor of Neurology at NYU Langone Health and co-director of the Marlene and Paolo Fresco Institute for Parkinson’s and Movement Disorders, has been involved in the care of HD patients and research since his participation in the Venezuela Collaborative Research Group, which isolated the HD gene 25 years ago. Kayson, Director of Clinical and Strategic Initiatives at the University of Rochester’s Center for Health + Technology (CHeT), has been involved in the care of HD patients and research since the inception of the HSG and was one of the founders of the organization. Feigin’s independent research has focused on the development of novel imaging biomarkers that could be used as outcome measures for HD clinical trials. 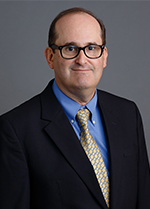 He has served in many HSG leadership positions over the past 20 years, including as a member of the Executive Committee, chair of the Program Committee for the HD Clinical Research Symposium for five years, and currently chairs the Clinical Research Advisory Committee. Feigin is the principal investigator (PI) of the SIGNAL trial and the co-PI of LEGATO-HD, and has served as a site PI on numerous other HD trials. “I am honored and excited to serve as the Chair of this amazing organization as the most exciting new potential therapies for HD are now entering human trials,” Feigin said. Prior to leading CHeT’s Clinical and Strategic Initiatives, Kayson was the Director of Project Management for the Clinical Trials Coordination Center (CTCC) at the University of Rochester and previously worked in industry. In addition, Kayson’s long involvement in all aspects of more than 50 clinical trials and the FDA approval of the only two drugs for HD gives her a deep understanding of clinical trial design, organization and conduct, and insights into and appreciation of HD clinical trials from the perspective of study participants to coordinators, investigators, CRO functions, and sponsors. She has served in many leadership positions in HSG, including as a member of the Executive Committee, co-chair of the HSG Credentials Committee, and co-chair of the HSG Educational Committee. “It is exciting to be part of the momentum of research in HD. I am honored to serve as the HSG Co-Chair and look forward to reaching the goal of finding treatments that make a difference for our patients and families,” said Kayson. HSG appreciates all the candidates who ran for these positions and salutes their enthusiasm and commitment to the entire election process. In addition, we thank each of our members who attended the webinars, viewed the webpages, and took the time to cast votes for this important election. As HSG begins our 25th year of seeking treatments that make a difference, let’s join in congratulating our new leadership and wishing them the very best as they pursue their vision of partnerships, innovation and education to bring an exciting future to HSG. 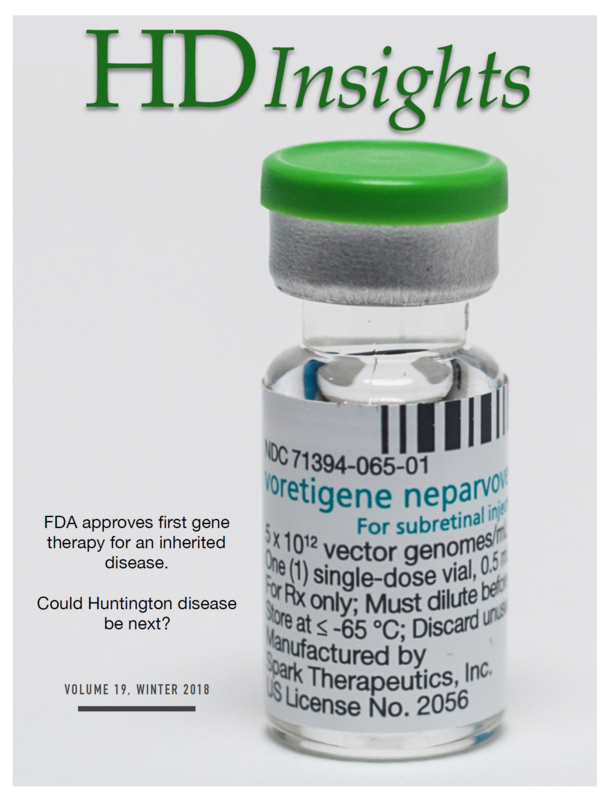 The new issue of HD Insights (Vol. 19) is out. Click here to read the latest news in HD research.